← We have our winners of Shadows in the Stone! I’ve been thinking about creativity. I don’t remember how I found this, but I made note of it to share with you because I think it’s such a fun and creative idea. A dad takes his children’s drawings and colours them (with their permission), and it’s amazing how it enhances their artwork. Take a look here. Did you ever think of doing this? I used to sketch. In school — don’t ask how long ago that was! — I took a sketching class, which was fun and I looked forward to it. Each week a member of the class would sit in the middle of the room and the rest of us would draw him or her. Mine weren’t too bad – if I do say so myself; they looked like the person, anyway. For years I occasionally liked to sit and draw what I saw out the window, or across the room – but I am long out of practice. I’ve been thinking of taking up sketching again, taking classes, maybe even learn to paint, but who has time? Maybe it’s not about that, though. Maybe it isn’t whether there is time for it, maybe it’s about allowing myself that creative outlet, another vehicle of artistic expression. A stress reliever. A mind-expanding experience. My dad used to doodle interesting little drawings. 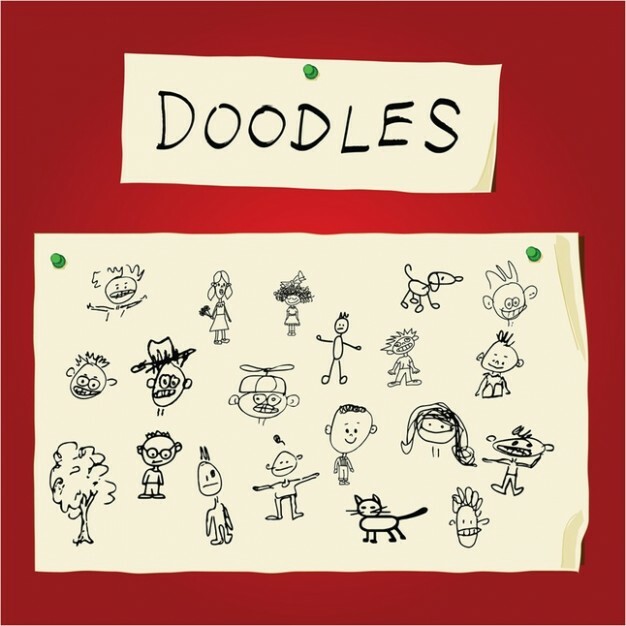 A few days ago I heard someone being interviewed about doodling. She said it’s very important because it is creative expression and also is something many people do while thinking problems through, processing things during conversations or meetings. I doodle sometimes, and my husband often doodles during his telephone conversations. My mother had a very creative mind. She sewed, crafted, planned fun family parties, made up cute stories and funny poems. After her passing we found a delightful children’s story tucked away. I remembered she had written it for a summer course many years ago. Dad would like to see it as a book, and it could be … Mum also painted. She took beginner classes and learned different methods, so now we have several of her paintings in different mediums. One of my daughters paints, beautiful work. Another can create very detailed drawings and embroidery work, another sculpts wonderful little creations from Sculpey (a polymer clay), another likes to bake fancy delicious desserts. This is just a glimpse of their artistic side. I remember when they were in school, each could come up with such good stories for writing classes, but unfortunately none of them chose to continue in that venue. It seems I’m in musing mode tonight. Now I have some questions for you. Do you have memories of creative adventures – good or less than satisfactory? Are there artistic expressions you wish you had pursued? Perhaps there are things you are reminded of and feel enticed to venture into again? Do tell! This entry was posted in Miscellanea and tagged artistic, creative, creative expression, creativity, doodling, painting, sketching, Writing. Bookmark the permalink. You reminded me of the play and skits I have written, plus some songs/choruses. It would be nice to find somewhere for those. I guess you know how I express my creativity. 😉 But I also loved sketching when I was younger. I had even picked up a sketch pad a few years back intending to use it. Didn’t happen. You’re right, Lynn, it’s really a matter of allowing ourselves to make time to explore all aspects of our creativity. Your expression of creativity is paying off, Laura. 🙂 Perhaps the day will come for you to use that sketch pad a little. too.